Topic Tuesday #24 2013/01/01 - "Happy New Year!" How lucky that Topic Tuesday has fallen on Christmas and the New Year! So the obligatory holiday education post is at hand. Let's look at the Calendar for origins of this, our only Global/Universal, holiday. On the Calendar(s): The primary calendar that we have wide familiarity with is the Gregorian Calendar, but the story doesn't start there. Let's go back to it's earliest incarnation. Numa Pompilius (753–673 BC; reigned 715–673 BC), second king of Rome, created the Roman Calendar which was superseded in 46 BC by Julius Caesar's "Julian Calendar". Caesar's version had the year beginning in January, unlike the Roman calendar that started in March. 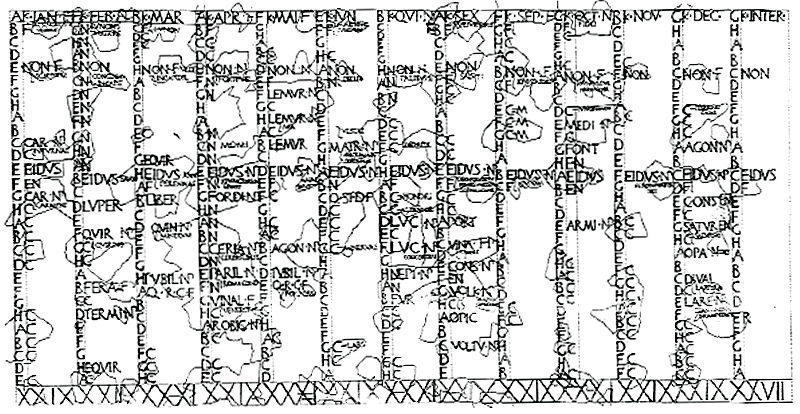 The Julian Calendar was utilized by most of Europe from 45 BC until it was superseded by the Gregorian calendar commencing in 1582. The Julian Calendar is still in use in parts of the world today and is primarily used to track observance dates of fixed feasts and moveable feasts. The Gregorian Calendar was promulgated by Pope Gregory XIII, after whom the calendar was named, by a decree signed on 24 February 1582; the decree, a papal bull, is known by its opening words, Inter gravissimas. Reform was required because too many leap days are added with respect to the astronomical seasons on the Julian scheme. On average, the astronomical solstices and the equinoxes advance by about 11 minutes per year against the Julian year. As a result, the calculated date of Easter gradually moved out of alignment with the March equinox. The Julian calendar gained a day about every 134 years. By 1582, it was ten days out of alignment from where it supposedly had been in 325 during the Council of Nicaea. The Gregorian calendar was adopted initially by the Catholic countries of Europe, with other countries adopting it over the following centuries. Since the Julian and Gregorian calendars were long used simultaneously, although in different places, calendar dates in the transition period are often ambiguous, unless it is specified which calendar was being used. The notation "Old Style" (OS) is sometimes used to indicate a date in the Julian calendar, as opposed to "New Style" (NS), which either represents the Julian date with the start of the year as 1 January or a full mapping onto the Gregorian calendar. This notation is used to clarify dates from countries which continued to use the Julian calendar after the Gregorian reform, such as Great Britain (switched in 1752), Russia (1918), or Greece (1923). January : "Ianuarius" is the original Roman designation of the month January. The name is either derived from the two-faced Roman god Janus, from the Latin word 'ianua', which means "door", or it is the masculine form of Diana, which would beDianus or Ianus (Janus). The Romans dedicated January and specifically New Year's Day to Janus. Janus is usually depicted as a "two-faced" god since one face is looking forward to the future and the other face looks backward to the past. January 1 was new year day: the day was consecrated to Janus since it was the first of the new year and of the month (kalends) of Janus: the feria (Latin -"free day") had an augural (fortune telling) character as Romans believed the beginning of anything was an omen for the whole. It became customary to exchange cheerful words of good wishes. For the same reason everybody took a break from their usual business, exchanged dates, figs and honey as a token of well wishing and made gifts of coins. All these were called 'strenae'. Cakes made of spelt (dinkel wheat, or hulled wheat) and salt were offered to the god and burnt on the altar. It is interesting to note that, according to the Catholic Encyclopedia, many of these customs have migrated to Christmas. Feast of Juno and Janus, god of beginnings and thresholds. On this day, no evil may be spoken, so that the day and the year may be sweet. "Words have weight, and the ears of the Deities are open." (Ovid, Fasti). Friends exchange small jars of honey with dates or figs, along with good wishes and coins. These were called Strenae, after the Sabine Goddess of Health. This custom has continued in France to this day. In medieval times, people wore animal masks on this day; this was called "guising." Greek: Gamelia, Feast of the Goddess of Marriage, Hera (corresponding to the Roman Juno). Anglo-Saxon: Wassail (Old English wæs hæl, literally 'be you healthy') "Be Hale (whole)" Additionally the tradition of wassailing which falls into two distinct categories: The House-Visiting wassail and the Orchard-Visiting wassail. House-Visiting wassail, caroling by any other name, is the practice of people going door-to-door singing Christmas carols. These have also migrated to Christmas. Roman: Feast of Aesculapius (Greek Healing God), his mother Coronis, and his daughter Salus (Health), whose Greek counterpart is the goddess Hygieia, though her functions differ considerably. Sumerian: Inanna's (Sumerian goddess of sexual love, fertility, and warfare.) Nativity feast is begun by lighting a white candle at sunset. It is to burn through the night and is extinguished at dawn. Modern Day, We drink, dance, sing songs, like Auld Lang Syne, to which we always get the words wrong. Happy New Year! May your hearts be full and your days easy. In "Calendar", "Gregorian", "Janus", "Julian", "New Year", "Roman", "Topic Tuesday", "TopicTuesday", "alternative", "canwefixit", "christmas", "education", "history", "holidays", "philosophy", "teacher", "teaching"